we are back in the Beauzone. We arrived home Monday July16. that are currently in Rock Hall, Md. in our coach (Monty Hall?) another night. The view out the back window was a bonus. Across the bay at night was the lights of Baltimore. Alas.. all good things must come to an end. Kate & Greg back to Beaufort to park the rig for now. Our drive home took about 9.5 hrs and was uneventuful. Home was just like we left it. 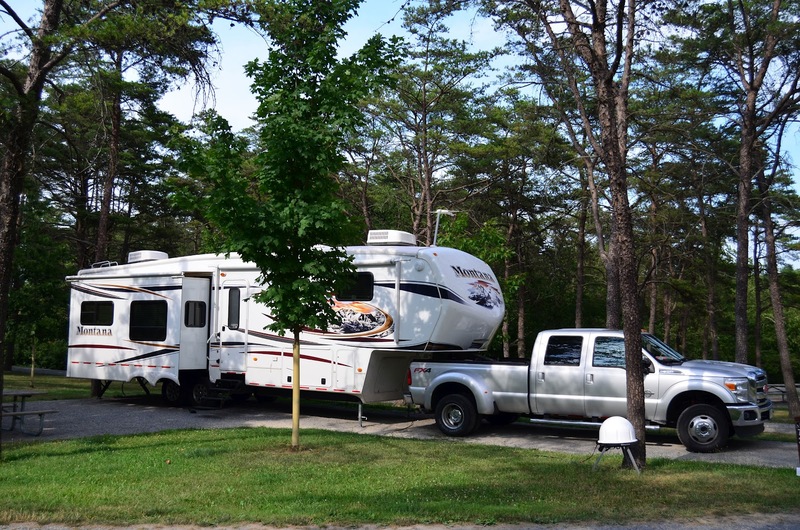 It's sad each time I pull the pin on the 5th wheel at the end of a trip. Each day when traveling has a purpose and a plan. that my head hits the pillow. call will look like. The constant change. Getting home is a culture shock. anyway - thats my next blog. For now... I have to go scrub the sailboat... the birds have made it a mess! We are in Shawnee State Park in Pennsylvania. about 9 hours with stops. the east is a bit of a culture shock when it happens so fast. Our ride today took us down about 30 miles of the Old Lincoln Highway. The lincoln highway was the first coast to coast highway. of government to build highways.... sound familiar? to mark the entire length of the Lincoln Hwy. the US from coast to coast as a demonstration of military preparedness. It took them about 2 months with many mishaps along the way. that good roads were needed. during World War II to see the German Autobahns first hand. that created our Interstate Highway System. That young officer was Dwight Eisenhower. 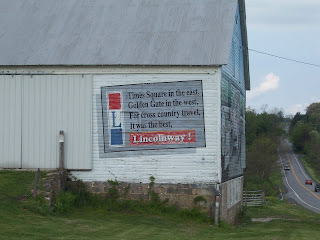 Today the Lincoln Highway, like route 66 - is just a memory. 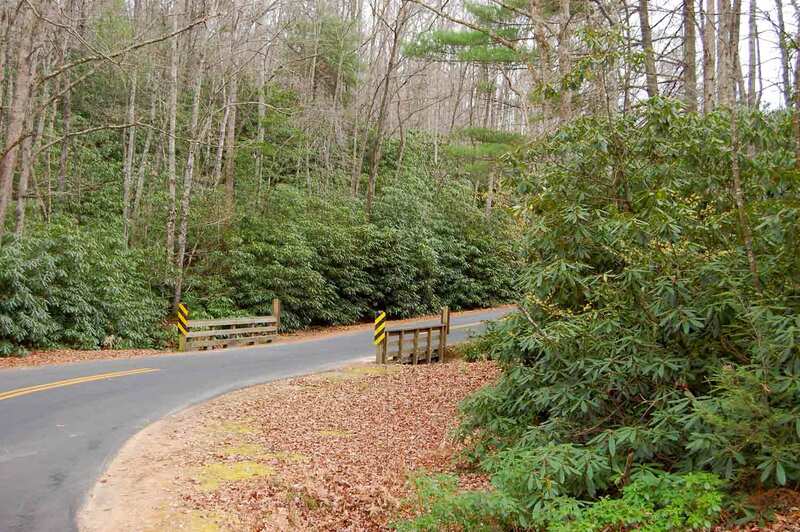 If you travel the side roads of America they are waiting for your discovery. We are now back in travel mode. our arrival Saturday evening and continued to rain all night and much of Sunday. and went to Penelopes for some Burgers. Paul had another Bison Burger.... yum. in a corner above the door to the Mens Room. off curbside, and then continued out of the airport and headed east on I70. It was pretty funny to watch the cops as we drove into the airport with our rig. as we passed them by. Kate and I then drove about 300 miles to Cedar Bluff State Park in the middle of Kansas. It was a nice little Oasis of trees and water in the middle of the Treeless Plains. with a beautiful sunset over the vast prairie. Today we woke up early, packed up camp and were on the road by 0830. Graham Cave State Park in Missouri around 430pm. campground to ourselves... no one else is here. blow the power box supplying the coach. to another state park - this one on a lake in Indiana. Has your GPS ever talked smack? Does it have a potty mouth? do not click the link below. Click the link below and see for yourself. A couple of days catching up to do. Weds - July 4th was our last day in Yellowstone. the West Thumb Geyser Basin & the Lake Area. that backdrop adds some interesting visuals. Last year when Kate and I visited, it was also loaded with Elk. spot in the woods to have a picnic. making a big loop till we exited the park once more thru the West Side. the park, exiting the south gate and into Grand Teton National Park. In Yellowstone you get to see virgin forest - untouched by loggers. wildlife, snowcapped peaks, lakes, wildlife, streams meadows & forests. Its quite an expansive and beautiful ecosystem. We arrived at the Colter Bay Campground in GTNP by 2pm. an early dinner. While there we had some rain. Our first real rain in almost 2 months! A few shots from Jenny Lake. It was first settled in the late 1800s and was once a thriving community. Further up Antelope Flats, we went 4 wheeling into the mountains. we were back in the valley, out of the trees, and into the sagebrush country. We paused for our self portrait of the whole crew. an early hour so that we can hit the road for our 8hr drive to Ft Collins, Colorado. On Sunday we will visit Rocky Mountain National Park. See you back in Colorado. 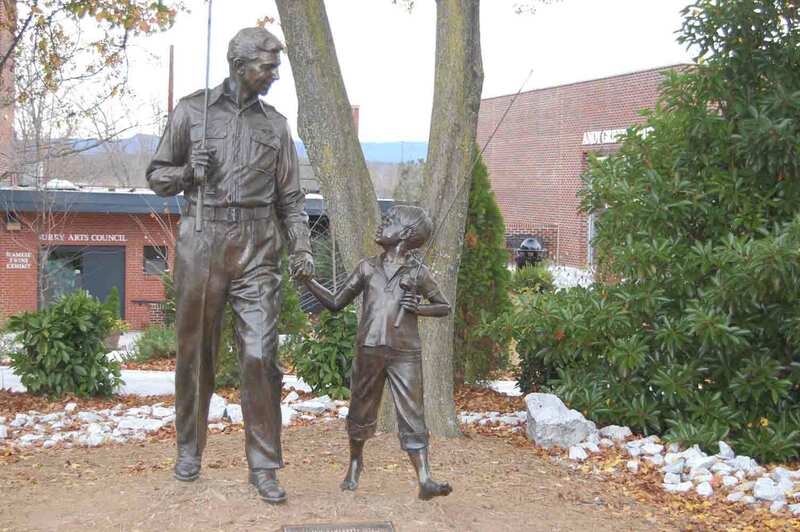 Andy Griffith passed away today. He was just one more piece of Americana that is slipping away. I was extremely fond of him and all that he represented. today would be a good day to repost it. Do you recognize this car? Ok let me warn you right off. I'm feeling a bit nostalgic today so I might start waxing philosophical. One of the reasons for our visit here at Stone Mountain State Park was our desire to visit Mt. 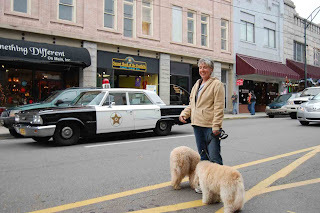 Airy, NC the birthplace and home of Andy Griffith. It was Mt. Airy that Andy used as the basis for Mayberry. 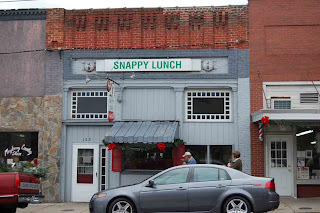 Many of the places mentioned in the series - Floyds Barbershop, Snappy Luch, well they are right here in Mt. Airy. I don't know about you, but I grew up watching Andy, and Opie, Aunt Bea, Helen and of course Barney Fife. There was always a lesson to learn, and a value to be gleaned from each and every show. Tolerance, Compassion, Responsibility.... it had them all. We might not have realized it then, but looking back it's hard not to see. It was a special place and time. Those of us who were able to live then, and share in that special place were truly blessed. They say you cant go back home - and I for one am a believer in that. Try as I have, I've learned that lesson the hard way. So todays adventure - while not truly going back to that place and time, at least was a fond remembrance. Our Day in Mayberry started with Lunch at Snappys and of course that means their Pork Chop Sandwich with the works. This is not a meal for the faint of heart. This is not Nouveau Cuisine. No this is good old down home Southern Cooking with all the cholesterol that you can handle. But boy was it good! They say this place is unchanged since Andy sat here as a young boy and the recipe is the same. 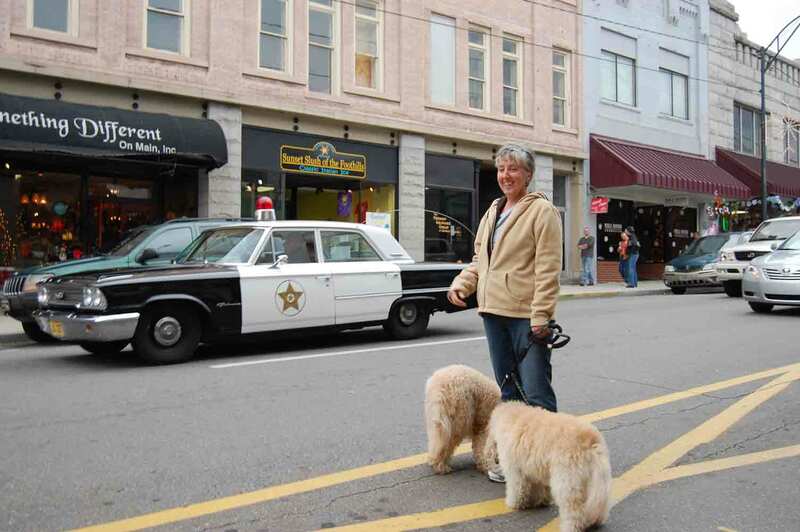 Walking the streets with the Doodles is always good for meeting people, and while Kate went in and out of all the stores, I stroked my Doodles on Main St and got to meet all the local characters. I have to tell you, one deputy who called him self Barney wanted to give me a ticket (just for fun) and one other gent who was the spitting image of Don Knotts in his later years stopped to welcome us to town and tell us how glad he was that we were here. 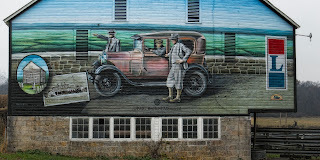 I have to say this just might be the friendliest town that we have ever been to and we've been to some friendly ones. 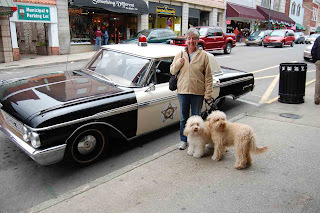 Several times we saw the Mayberry Squad Car drive by. There were several of them. Ford Galaxy 500's. I don't have a clue to what the year is but they are the real deal. On the way out of town we stopped by the Andy Griffith Museum where they have this bronze statue out front. Remember the opening scene where Andy & Opie walk hand in hand to the "fishing hole". Well here it is preserved for all time. It was a great day with alot of fond memories. Thanks Mayberry. Back at the State park, I just had to show you a picture of the road with all the Rhododendrons everywhere. This place is just loaded with them. We have to come back here when they are blooming. It has to be out of this world! 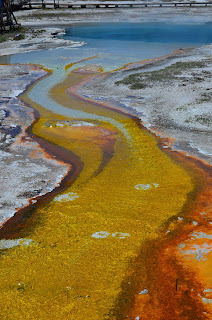 After enjoying them for a while we continued north to the Norris Geyser Basin. The view from above before you descend into the basin. At the bottom... more colors. Todays colors are a bit more pastel compared to yesterday. The Grand Canyon of the Yellowstone. The colors of the Canyon wall are always a crowd pleaser. The Falls however are the main event! This is the view from Artists Point. A closeup with the telephoto. just a few minutes earlier. Artists point was also the setting for todays self portrait. Unfortunately Kates Melon is blocking the falls! Named after a friend of mine.. In search of elusive wildlife. On the way we spotted this trio of Bison. This is a view of the Hayden Valley. One of the most beautiful places on mother Earth. I never get tired of seeing this view! We found a quiet spot to hang for a few. to see all that I had scheduled. The winds howled for a couple of hours and then calmed down. We are waiting to see it tonight the scenario repeats or not. some Oscars Bacon & Egg Sandwiches. my favorite place on this Earth... Yellowstone National Park. never get tired of Yellowstone.... Today was no exception. Everytime that I visit it blows me away! First we found a nice quiet stream. for Lunch. If you've never seen the lodge you can see pictures in our blog last June. It's a beautiful old historic building. of Pear & Proscuito Panini. the site of todays Self Portrait. Does Old Faithful erupt when I'm not there? and the main event there - The Grand Prismatic Spring. 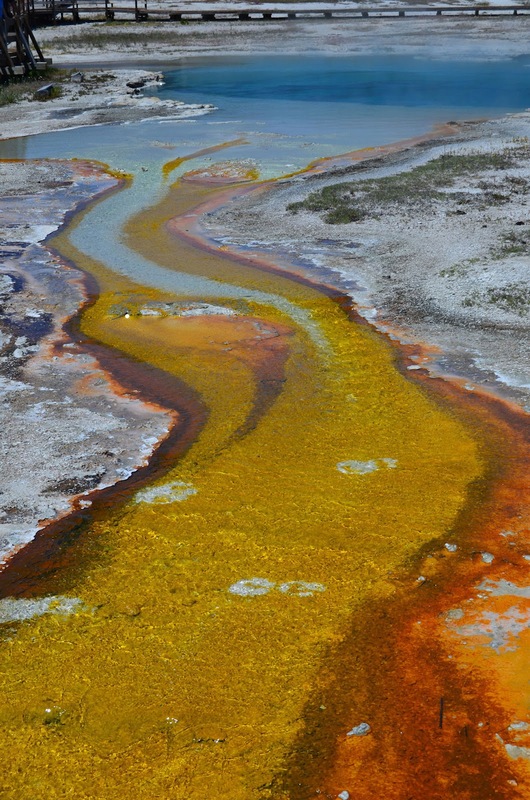 and the West Thumb Geyser Basin. Dakota Ridge RV Park in Golden, Co at 1100 so we had some time to kill. drop the trailer so we didn't have to drag it thru the airport. all the places that I used to live. anything like the picture that I held in my mind. The trees were bigger, the houses were older.... and so am I! We stopped by the Arvada (my old town) Recreation Complex. 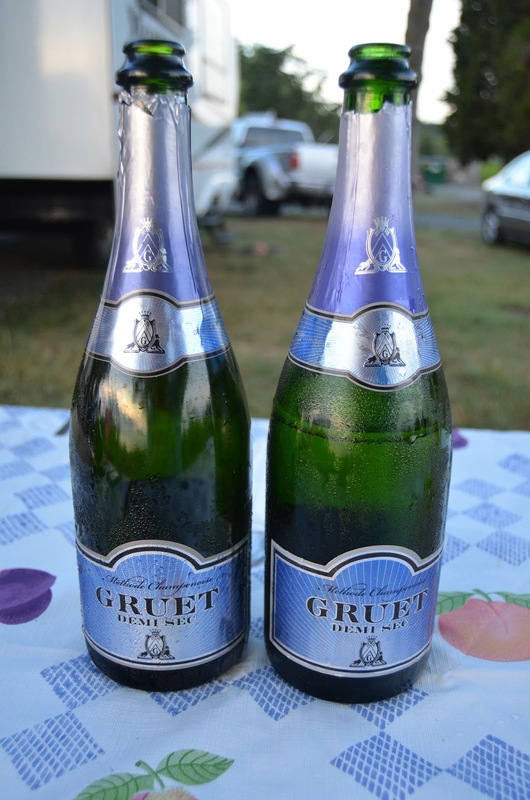 where we stayed in a small RV Park next to I80 for the night. a site in Grand Teton National Park for the night. camp just in time for cocktail hour. several hours chatting as the day dwindled away to night. Soon it was time to hit the sack. we'd been experiencing in Colorado recently. Kate and I and decided that she would rather spend the night with Uncle Paul. a vacant campsite in the sun to warm up. 4 nights - Lake Henry State Park in Idaho. This is a picture of our site.